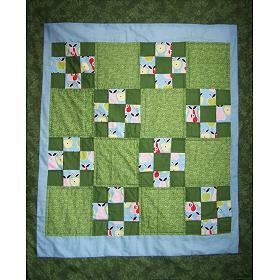 This crib sized quilt is made from high quality fabrics and each square is completed with detailed machine quilting. The first time you wash it the 80% cotton batting will shrink slightly and the quilt will acquire a slightly rumpled, or popcorn surface. This is normal and will give your one-of-a-kind quilt an antique look.